After months of brainstorming, you’ve finally come up with an idea for your store. Now comes the hard part: bringing your idea to life, and delivering it to your customers. Manufacture the product with a partner. Purchase the product wholesale and resell it. Dropship the product and retain the profits. Some of these methods give you more control but require lots of capital. Others let you start with little investment but limit what you can do with your product. In this post, we’ll dig into each of these four product acquisition models and help you zero in on the method that works best for you. You’ll learn the pros and cons of method, along with capital requirements. This is what most people dream of when they think of starting their own eCommerce stores: to design and make each product themselves, slowly crafting it to perfection. You might call this the artisan model. You have a lot of control over the final product, but you’ll also need to invest heavily in the making process. Fashion designers, natural beauty product brands, and the like usually follow this model. Making our product allows us unlimited creativity. We have precise control over our designs, our brand and quality of apparels we produce. But there are limitations too. We have to be involved at every stage — from purchasing raw materials to getting labor to number of pieces we can produce. We need a studio to work, a storage place of our inventory — right down to packaging and delivery of our products. And that means, if a customer likes our work — the praise is all ours! You get control over the entire product experience, from the product and packaging to the website and marketing. On the downside, you have to design, make, store, and deliver each product yourself. That’s a lots of hats for an overworked entrepreneur to wear. Who Should Follow This Model? Creative people, people with unique product ideas, and DIY enthusiasts. If you obsess over perfecting the entire product experience and have the expertise to make the product from scratch, this is the model for you. If your buyers care about enjoying a uniquely crafted experience, this model will work particularly well. Low startup cost: If you are making your own product, you can pick up orders first and then produce them. You will not need to buy and store a number of units first. It means that you can invest time and money in exact correspondence to your order size. You also avoid heavy initial labor and setup costs, a major plus when you’re starting out. Complete control: Making the product yourself gives you complete control over the entire product experience. You can source materials of your choice, craft them into designs of your choice, and create unique packaging. Very time-consuming: From sourcing the raw materials to producing and packaging the finished goods, this method demands a lot of time investment. You’ll find that making the product yourself leaves you with little time and energy to handle other parts of your business, such as marketing, billing, inventory management, and so on. Scalability: Your potential product options will be limited to your skill and resource set. It also means that if you grow your business, you will only be able to produce a specific number of units per day. If you start getting bulk orders, you might have to manufacture your products with a partner. This, of course, means that you won’t have the same control over quality. Your average Etsy seller is a great example of the Make model. These are usually artisanal products crafted individually by the seller. For an example of a store on Ecwid, take a look at Kant, where each product is handcrafted by an individual designer. Or, check out UncommonGoods.com’s handmade section. Want to build your own brand. Enjoy making products yourself, or see yourself as a maker. Have a partner who can help manage the website, billing, marketing, and other to-dos. Instead of making products yourself, you can source them straight from manufacturers, which includes domestic and overseas manufacturers. China is the go-to source for finding cheap, reliable manufacturers. Start your search on Alibaba.com, the largest B2B marketplace in the world, and contact multiple manufacturers for samples and quotes. We covered manufacturing products through Alibaba in an earlier post. You can check it out here. Other alternatives to Alibaba are TradeKey.com, Made-in-China.com, and IndiaMart.com. Of course, you don’t have to go overseas to find a willing manufacturing partner. You can find partners right in the US through MakersRow.com. If you’re in Europe, check out All.biz. Sourcing products from manufacturers is the single most popular method for bringing products to life across the world. From tiny eCommerce stores to massive brands, most businesses tend to outsource their manufacturing to third parties. TAL Group (based in Hong Kong) is the biggest producer of menswear in the world. One out of every 6 dress shirts sold in the US comes from a TAL Group factory. Our clients include fashion brands like Eddie Bauer, L L Bean, Brooks Brothers and Burberry. Beyond making clothes, China is also responsible for manufacturing 90% of all computers, 70% of all phones, and 63% of all shoes, usually for your favorite American brands. Manufacturing your product (or having a third party manufacture it) is a good idea if you have already tested your product in the market and know for sure that it will sell. Your product should also be distinctive enough to beat out any competitors. On the downside, it requires upfront financial investment, so naturally, you have to have a big enough purse to use this model for your business. Lowest cost per unit: If you manufacture in bulk or buy products in bulk from the manufacturers, you are likely to achieve the lowest cost for each unit in your inventory. Lower cost immediately translates into better profit margins. Reasonable control over quality, brand and prices: Working with a manufacturer allows you to control the quality of your final product and set your own prices. You can also brand it yourself, including the packaging. It’s a complicated and time-consuming process: When you manufacture a product or get it manufactured, there are many stages involved in the process, including prototyping, sampling, refining, and production. You’ll also have to spend a considerable amount of time finding the right manufacturing partner. Patience is a virtue with the manufacturing model. Dealing with overseas manufacturers: Overseas manufacturers offer low prices, but are difficult to verify. Their manufacturing and labor standards are often lower, which might hurt the quality of product you are selling. There is also fear of intellectual property theft and the chance of being scammed. Plus, you’ll also have to work out any communication issues. Virtually every brand you love operates under this model. From Nike to Apple, the approach is the same: design the product, then outsource manufacturing to a partner. Here’s one store that built a billion-dollar valuation sourcing its product from manufacturers: Warby Parker. Have enough capital to invest in manufacturing. Are comfortable with handing off manufacturing responsibility. Are willing to work out communication, payment, and tooling issues with the manufacturing partner. Buying from a wholesaler simply means that you buy your products (as many brands as you like) at wholesale rates and resell them at higher prices. Consider how Best Buy sells Logitech keyboards and Dell computers. If you are wondering why would you buy from a wholesaler instead of going straight to the manufacturer, here’s a simple answer: most manufacturers are simply not interested in dealing with small-time buyers. Their hands are already full with making the product. They prefer to deal with wholesalers who buy products in bulk and deal with the distribution and logistics. If you are a new entrepreneur without a new idea, there are high chances that you will never deal directly with a manufacturer. Instead, you’ll be directed to their one of their wholesale distributors instead. When you buy in wholesale, the Minimum Order Quantity (MOQ) you have to deal with is much lower than when you deal with a manufacturer. For some products, it can be as low as just one unit. This makes the entire wholesale experience not only easy, but also extremely cost-effective. Purchasing wholesale means that you are still getting your products at a below-market cost. This means you will need less initial investment of time and money to get started. You will also be able to pick and choose a variety of brands and products for your venture. If you deal with wholesalers, you can choose a niche area, curate a selection of products and brands around it, and resell them from your online store at retail prices. This is perfect for entrepreneurs who want to run a store but don’t really have a unique product idea. If marketing, branding, and inventory management is your thing, the wholesale model is perfect for you. Brands and products already have a market: When you pick up products and brands that people are already buying, you already know that there is a market for them. Since you skip the product-market fit step, you take on much lower risk. Easy to get started: Buying from wholesalers allows you to stock products at your will. You need less investment of time and money. Better deals: Whenever an updated model of a product is introduced, its earlier versions are often sold off in small batches at massively reduced prices. Similarly, catalog products may be sold off at highly discounted prices by the warehouses. Shop around, compare the prices, and haggle to lower the prices. All of this pays off by increasing your profit margins. High competition: Since your brands and products are already on the market, you will have to fight hard with other online businesses to attract buyers and make them buy from you. For a popular brand, you might have dozens—if not hundreds—of competing sellers. Brands’ rules about price control: Some brands have certain rules and regulations about the minimum price at which you can sell their products. It means that you will have to be careful with the holiday offers and sales discounts you offer to the visitors browsing through your online store. Inventory management: When you buy from a wholesaler, you still need to manage your inventory and know what to order, how much to order, and when to order it. You also have to deal with shipping and delivery. Tools such as AfterShip and ShipWire can make this a bit more pleasant. Supply chain management: If you are dealing with many supply partners at a time, they can become difficult to manage. Sooner or later, you are going to end up with a supplier who is unreliable and sends you late delivery, early delivery or no delivery. eBay is the perfect place to find businesses that use the wholesale model in the wild. If you see a seller offering a new, branded product, it was probably acquired through a wholesaler. 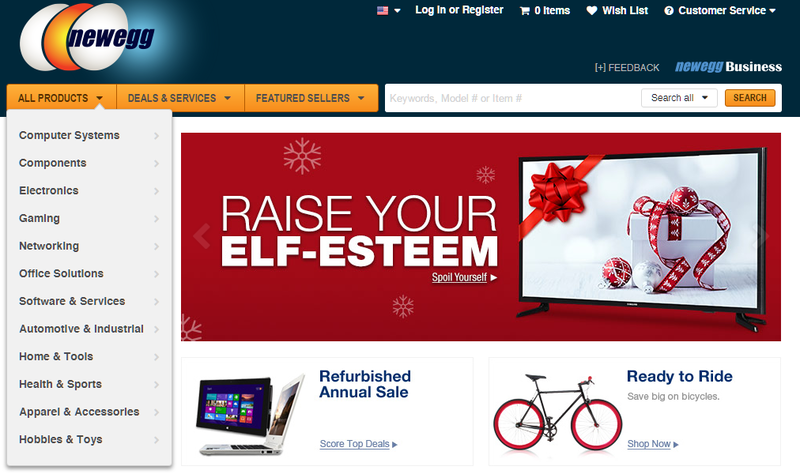 Even big retailers like NewEgg frequently work with wholesalers to acquire their products. Want to mitigate risk by selling tested-and-true products. Have existing expertise in marketing, or a strong online presence. Are okay handling shipping, inventory, and logistics. Don’t have any product ideas of your own. The dropshipping model is similar to wholesale with one crucial difference: dropshippers take care of the shipping, delivery, and inventory management for you. This means that you can start without storing any inventory, dealing with any manufacturers, or worrying about shipping. In other words, you are just the face for the dropshipper. Customers buy products from your store, which are then fulfilled by your dropshipping partners. These partners will package the products and deliver them straight to your customers. The difference between your price and the dropshipper’s price is your profit. The benefits to business owners are pretty clear here: you’ll take almost zero risk, and won’t have to deal with all the pesky details of eCommerce, like shipping and logistics. You just need a website and a way to accept payments (Ecwid can handle both). Dropshipping is the cheapest startup option possible for an eCommerce entrepreneur. If you have little time or money to invest, this is the way to go. It is a great option for work-from-home parents or 9-to-5ers who need a side hustle that can be managed remotely. Low startup costs: Since you don’t have an inventory, you only need little investment in the business you are about to start. Great flexibility: Since your dropship partners are handling everything — from fulfilling the order to shipping — you have the flexibility to manage your business from anywhere in the world. High competition: Little investment means that competition is tough. Unless you have deep marketing expertise, distinguishing your brand from competitors can be a tough ask. Extremely low profit margins: In wholesale business, you generally have a profit margin of about 20% or above. In dropshipping, however, it can be 10% or lower. Low profit margin means that you will have to sell a lot of stuff to make a sizeable profit. It also means that you will also need to pay more attention to your content and customer service to be able to attract customers. You have the least control over prices, inventory, and product quality: The reputation of your brand is very much into the hands of your dropship partners. If they ship low-quality products or do not send products in time, it will reflect poorly on your brand name. It also becomes difficult to sync inventory, and backorders pile up. 30% of all retailers use dropshippers for their fulfillment needs—there are a lot of eCommerce stores built on the dropshipping model. 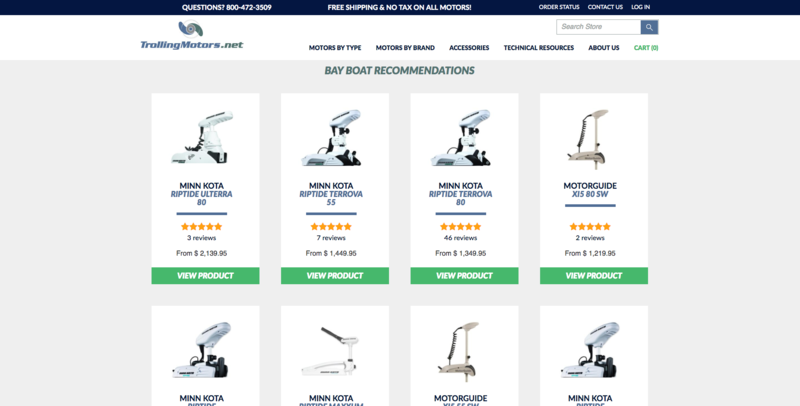 Most of these stores sell niche products, such as this store selling trolling motors for fishing boats. Don’t want to handle inventory or fulfillment. Have strong marketing and customer service expertise. Don’t have significant capital to invest, or any unique product ideas. If you’re just getting your feet wet with eCommerce, drop shipping is a great model to start with. Once you get comfortable with running a store and handling customers, you can graduate to a wholesale or manufacturing model. The eCommerce model you choose to go with will depend mostly on your existing capital, expertise, and the kind of business you want to run. If you’re a maker and want to run a lifestyle business, go with the Make model. If you want to scale and keep costs low, choose the Manufacture model. If you want to resell successful products, choose the Wholesale model. If you want to try out eCommerce with minimum risks, try Dropshipping. Whatever model you choose to use, you can use Ecwid to run the eCommerce store for it, on desktops and mobile phones alike.